Overlooking the wonders of the Ozarks, the ten story newly remodeled Radisson Hotel Branson is centrally located along 76 Country Boulevard in the live music mecca of the US. The Radisson has a full-service concierge that can assist you with your show or dinner plans so you spend more time in the indoor/outdoor pool, hot tub, sauna, exercise room, gift shop, Wildwood Bistro and the Time Out Sports Lounge. Room service is available. The hotel also offers banquet/meeting facilities, executive boardroom, laundry, and translation services. 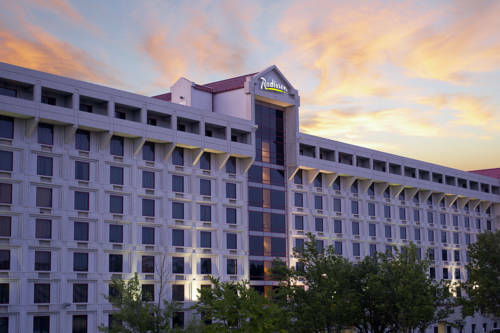 Just off the Highway 76 strip, the Radisson Hotel is located in the heart of Branson next to Andy Williams' and the Grand Palace Theater. Visitors of all ages are provided a wealth of entertainment options in Branson. Music shows range from country to gospel, Broadway to big band, easy listening to pop. The hotel is within two miles of Dixie Stampede, Jim Stafford's Theater, and Mickey Gilley. Country Tonight is 3 miles away. Wildwood Bistro: Boxed lunches at front desk. Tablerock AB: 8,076 square feet in 3 rooms. Ballroom is 6500 square feet. Seating for up to 700 people in ballroom.